“This has been a passion project for myself and my husband since day one, with the goal of designing a space that we would ultimately live in, and we have undoubtedly achieved that,” said Kirsten Norman. 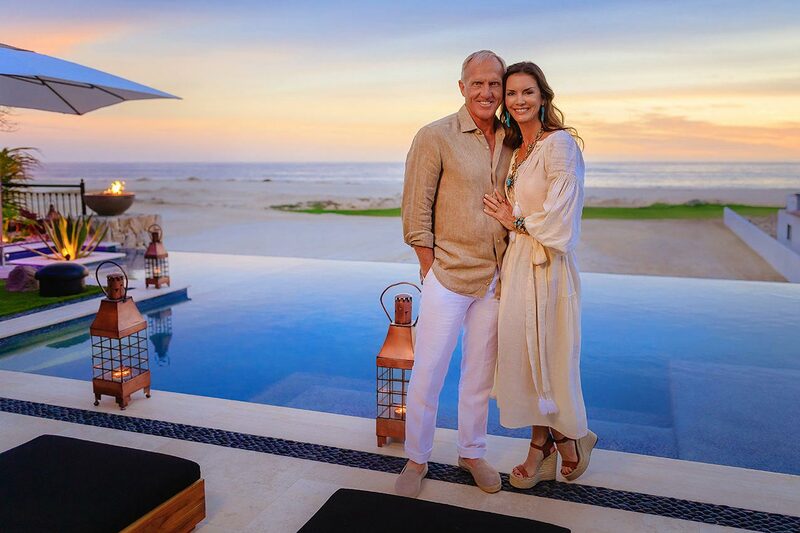 West Palm Beach, Fla. (March 20, 2019) – Greg Norman Real Estate today announced the official debut of luxury real estate and lifestyle community, Norman Estates at Rancho San Lucas, following the unveiling of the model villa at an event in Los Cabos on Friday, March 15. As Cabo’s most anticipated new golf resort community, Rancho San Lucas is an 834-acre master-planned Solmar Group development located 10 minutes from downtown Cabo San Lucas and boasting 1.2 miles of expansive beachfront on the Pacific Coast. Perfectly situated in a prime oceanside setting and framed by a Greg Norman Signature Golf Course, Norman Estates is a private, gated enclave within Rancho San Lucas featuring 32 luxury estate homes and 36 condominiums. The development continues its growth after successful pre-launch sales with nearly 40% of Norman Estates phase one single-family homes sold in a whisper campaign to Solmar Group friends and family. Greg and Kirsten Norman celebrated the official launch of their first foray into real estate in Mexico, with the grand opening of the model villa, attended by members of the international media, brokers and prospective buyers. In concert with the Rancho San Lucas masterplan, Norman Estates features coastal hacienda-style homes that reflect a rustic-meets-contemporary ranch-inspired aesthetic. The carefully selected design is the work of Norman Design Group’s acclaimed interior designer, Kirsten Norman, whose vision blends masculine and elegant touches that ensure every detail is a natural continuation of Greg’s distinctive lifestyle. The beachside luxury homes are priced from $3.5 to $7 million and owners will have access to an exclusive, members-only private beach club. Construction has also begun on the the first oceanfront high-rise residences at Norman Estates priced from $1.5 to $4.3 million. Set to open fall 2019, the Greg Norman-designed Rancho San Lucas Golf Club features seven ocean front holes and an island green with routing that winds its way around golden sand dunes, through arroyos and down to the Pacific. At completion, Rancho San Lucas will include a village with shopping, dining and entertainment; an expansive community park with a lake, biking and hiking trails and family picnic areas; as well as a luxury resort, tennis center and much more. Greg Norman Real Estate (GNRE) is an integrated international real estate development firm focused exclusively on bringing the Greg Norman brand to high-end luxury developments and golf courses. A true pioneer, Greg Norman revolutionized the real estate space by identifying that the recognition and value of a celebrity name would drive increased sales and premium home prices. Greg and his team take a unique, hands-on approach to provide services throughout the entire process including project envisioning, site planning, marketing and sales, and interior and architectural design. As an industry leader in both branded real estate and golf course design, GNRE ensures a level of superior quality with the distinctive Greg Norman style that drives value for clients across residential, resort, clubhouse, restaurant and hotel projects. Established in 1973 Solmar Group includes a collection of five all-suite resorts offering guests the highest quality of service and hospitality and the master-planned private resort community of Rancho San Lucas. Within the past year, two of the group’s properties; Playa Grande Resort and Spa as well as the Solmar Resort and Beach Club were awarded the RCI Gold Grown Resort Award. Additionally, TripAdvisor recognized Grand Solmar Land’s End Resort & Spa among TripAdvisor’s Traveler’s Choice Awards. The property was ranked 8th among the Top 25 Hotels in Mexico and received TripAdvisor’s Certificate of Excellence. For more information about Solmar Group, visit www.solmar.com.